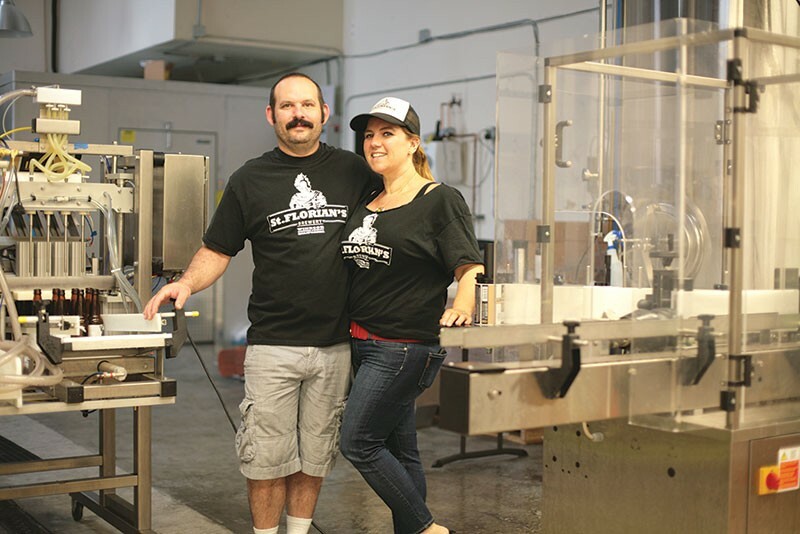 BOTTLED UP Among small brewers who keep their production in-house are Aron and Amy Levin of St. Florian's in Windsor. From Russian River's iconic redwood to 101 North's black-and-white freeway sign, craft beer is often marketed as a regional vintage. Small by definition, artisanal malt-masters rely heavily on tasting rooms, pubs and distributors close to home, making for local, tight-knight brew scenes. At least, that's the mythology perpetuated by label images like Rogue—depicting balding Oregon homebrewers—and Anderson Valley, with its gorgeous background of Mendocino countryside. But small and hyperlocal don't always go hand in hand. Take 21st Amendment. Despite its coveted location next to the Giants' ballpark, and cans displaying the Golden Gate Bridge, most of its hoppy beverages are shipped in from Minnesota from a brewery called Cold Spring. The company didn't respond to interview requests for this story, but is hardly deceptive about where its libations are brewed—the info is right on the can. The practice highlights an interesting trend in a marketplace where small is big. Despite the artistic notion of your home-brewing neighbor opening shop on recipes and talent alone, vats and bottling lines do not come cheap. "It's really, really expensive to put in that kind of equipment," says Ron Lindenbusch, CMO of Lagunitas. The Petaluma institution has historically brewed, bottled and labeled all of its hoppy suds at its Sonoma County headquarters, but Lagunitas is now opening a second brewery in Chicago to the tune of around $24 million. And loans are often hard to come by for newbies, Lindenbusch says, adding, "You need to be doing enough business to get [the banks] to pay attention." Thus the initial dilemma of Jeremy Cowan, founder of Shmaltz Brewing Co. The kosher brewery, which boasts the tagline "Delicious Schtick" and plays on Cowan's Jewish roots with drinks like "He'Brew: The Chosen Beer," began in 1996, when its founder had $2,000 in his bank account. And he wasn't a brewer—just a diehard craft beer fan. So he found a local master to make the He'Brew beer he'd been envisioning, and then bottled, labeled and hand-distributed it around San Francisco in his grandmother's car. Since, Shmaltz has continued to engage in what's known as "contract brewing" through Mendocino Brewing Co. and its subsidiary in upstate New York (Shmaltz was finally able to open a brick-and-mortar brewhouse this summer). Contract brewing is essentially outsourcing, but Cowan would argue that the connotations—at least now—aren't nearly as negative. "It's pretty well-documented that in the '80s and '90s, contract brewing got a bad reputation from both directions," he says, speaking of both craft and corporate brewers. But, he adds, "it's very difficult to run a tiny brewing operation. On the very small side, contract brewing can provide a wonderful opportunity for experimentation without the incredible overhead." Contract brewing has many shades, from hiring a brew master to develop recipes, to simply using someone else's equipment, as 21st Amendment reportedly does. In an interview with the website Serious Eats, founder Shawn O'Sullivan says he goes back to Minnesota monthly to brew the company's gamut of wheats, seasonal saisons and IPAs, claiming the practice is a little like using a friend's kitchen to make lasagna. But although the practice is slightly more common in the Bay Area where the rent is so damn high, contract brewing only makes up about 1.7 percent of total craft production, according to the Brewers Association. Like Lagunitas, most hopsmiths still do things the old-fashioned way. "We wanted to own our own stuff without any kind of middleman," says Lindenbusch, adding that the early years were financially tight. "Tony [Magee, Lagunitas founder] refinanced his house four times." St. Florian's in Windsor is a smaller Sonoma County candidate brewing and bottling on the DIY. Named for the patron saint of firefighters, the fledgling brewery opened this year after beermaker and Windsor fire captain Aaron Levin had been experimenting for years. "This being Sonoma County, we would offer it to our friends who were all wine drinkers," his business partner and wife, Amy Levin, recalls. Though originally skeptical, she says, they would always hand her back an empty glass. Now the startup has a bottling line and labels to go with its hand-brewed suds. "It made more sense for us not to rely on someone else," she says, echoing Lagunitas. "And we'll have a higher profit margin in the end."